​24 hours notice is required for all private session cancellations. Any missed session without 24 hours notice must be paid in full. 3 days notice is required for all pre-registered session cancellations. If a class must be missed during a pre-registered session, the class may be made up at an appropriate alternate class during the course of the session. ​“I have enrolled in the personalized health and fitness program offered through Boomerang Pilates and Wellness Inc. I recognize that the program may involve strenuous physical activity including, but not limited to, muscle strength and endurance training, cardiovascular conditioning and training, and other various fitness activities. I hereby affirm that I am in good physical condition and do not suffer from any known disability or condition which would prevent or limit my participation in this exercise program. I acknowledge that my enrollment and subsequent participation in purely voluntary and in no way mandated by Boomerang Pilates and Wellness Inc. Alternately, I affirm that I will disclose any injuries, past or current, or any other health conditions that may affect the exercise program designed for me by Boomerang Pilates and Wellness Inc. and any of its agents." ​I HEREBY AFFIRM THAT I HAVE READ AND FULLY UNDERSTAND THE ABOVE STATEMENTS. 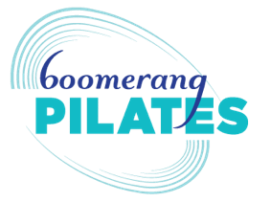 All services purchased from Boomerang Pilates and Wellness Inc. must be preceded by the applicant acknowledging, by way of completing a waiver form, that he/she has no physical limitations preventing him/her from participation. All applicants under the age of 18 years must have consent, in written form, from a parent or guardian. The applicant also agrees to abide by the rules and regulations of the studio and acknowledges that these rules and regulations may change from time to time. Furthermore, all applicants release Boomerang Pilates and Wellness Inc., its owners/ partners, directors, managers, instructors and all employees of all liability regarding 1) any injury to self or child 2) any loss or damage to personal property. If purchasing packages that require payments to be made in installments or recurring payments, the applicant agrees to approve such installments be made by credit card on the dates as predetermined in the services contract. ​All prices are subject to 13% HST. Group classes, single and multi visit passes are non refundable. Unused visits can be transferred to a person of your choice with original expiry dates (where applicable) maintained. There are no refunds for non use. Packages for private and semi private training are non refundable but can be transferred to another individual with original expiry dates maintained. There are no refunds for non use. Products may be returned within 14 days for exchange only. Returns are valid only for products that have not been opened, used or damaged. Products that are defective or damaged may be returned immediately for exchange only. All prices are subject to 13% HST.